Avid home cook and food blogger Malcolm Bedell turned to the Internet to help fund his 'Wich, Please sandwich truck, and the Internet came through. People pledged nearly $30,000 last fall through the online website Kickstarter and Bedell's business, parked at Rockland's Buoy Park, had its soft-opening last week. 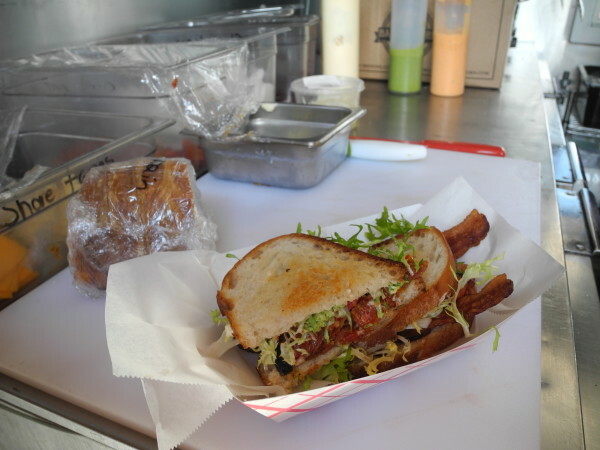 The tomato confit BLT is one specialty of 'Wich, Please, the new food truck that Malcolm Bedell just opened at Buoy Park on the Rockland waterfront. The $7 sandwich features tomatoes that have been slow-roasted in bacon fat, bibb lettuce, thick-cut bacon and country white bread. ROCKLAND, Maine — The bright red food truck was fragrant Saturday with the aromas of sizzling bacon and fresh griddled bread, the view of Penobscot Bay behind it seeming to stretch out forever in the spring sunshine. The bustle and mouth-watering smells could mean only one thing: Malcolm Bedell and ‘Wich, Please, his community-funded sandwich business, have finally rolled into Rockland’s Buoy Park. Last fall, Bedell raised nearly $30,000 in startup funds for the food truck through the entrepreneurial website Kickstarter, making ‘Wich, Please the 7th-most funded food truck in the website’s history. What that money has meant to the food blogger and avid home cook is pretty indescribable, he said Saturday, a few days after his soft opening. The funds allowed Bedell to purchase the tricked-out concession trailer from a man in Atlantic City, New Jersey, who had used it for just one season to serve small-plate Spanish tapas. Its kitchen was well-outfitted with a grill, refrigerator and a deep fryer, Bedell said, although it did need — and got — a thorough cleaning. Next up was finding a space to park it and securing city permits to do so. Rockland city councilors voted to change the ordinances to allow a third food truck to set up at Buoy Park, a location right behind the police station that overlooks the harbor. Bedell’s neighbor is Pho Sizzle, a popular business that sells fresh Vietnamese food, and in past years another truck operated out of the park, but not this summer. “The location is awesome, and the city’s been really cool and really easy, which is not always what you hear about city government, so that’s been a big surprise,” he said. Bedell tweaked the menu for the soft opening, dreaming up gourmet-sounding sandwiches such as pork belly porchetta on a fresh roll, grilled chicken curry and the Reubenesque, a vegetarian sandwich featuring roasted beets and Morse’s sauerkraut. 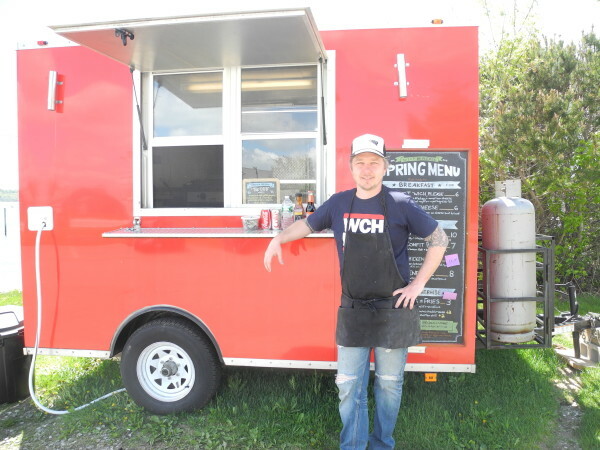 One thing he couldn’t do before the first business day was to get a sense of what it’s like to be knee deep in sandwich tickets while juggling the grill and all the other aspects of a food truck. Previously, his day jobs have been in marketing, though his food blog From Away has garnered a large audience and Bedell has done well in national cooking competitions. He and his helper, Nick Pooley of Waldoboro, have been working out the kinks, and so far, so good, they said. “It’s been building every day,” Bedell said. He plans to keep the menu interesting and manageable, and will change it up seasonally. They’ll cook up breakfast sandwiches in the mornings and Fridays will be taco nights. The first taco night was a success, Bedell said. He said that he’s gotten a kick when people who helped to fund the truck stop by. ‘Wich, Please, located at Buoy Park on the Rockland waterfront, is open from 8 a.m. to 3 p.m. Tuesday through Thursday, from 10:30 a.m. to 8 p.m. Friday and from 8 a.m. to 3 p.m. Saturday and Sunday. For more information, call 390-5679 or visit the website www.wichplease.me.